← Days 154, 155 and 156 – Morse code! All three of these days were very busy for me and so I managed just two QSOs on each day but that’s one more than I’ve said I’ll do and I’m still very happy to be playing radio every day. On day #157 I decided to have a shout on 2m for a change and after a couple of calls I had a reply from Terry, G0TKJ in Barnsley and we had a good chat for about half an hour. After that I dropped down to 40m and heard a massive pileup all calling a Special Event station, PA05FOX. I joined in the throng and after about twenty minutes I was on the verge of giving up when I decided to grab my Heil Pro Set Plus headset and give that a try. It’s normally connected to the wireless but I’d taken the station apart at the weekend and not reconnected the headset. I plugged it in, tried again and this time I got through the pileup on my second shout. I really can’t recommend Heil microphones enough as I’ve noticed a few times that I seem to be able to get through pileups quite easily when using my headset with the HC-4 insert selected. On day #158 I spent some time at the Martello Tower operating our own Special Event station, GB4MTG and so I had two quick contacts myself from home before heading off – I worked DL6NK, Eric and 2E0KDX, Kevin both on 40m. I’d planned to go to the Harwich club on day #159 and so I had a couple of shouts before leaving home and worked MS0RSD on the Isle of Skye and then GW0MYY, John in Milford Haven on 40m. I had a nice surprise when I got home from work as there was a brown envelope from the RSGB QSL bureau waiting for me and in it were ten QSL cards as pictured below. 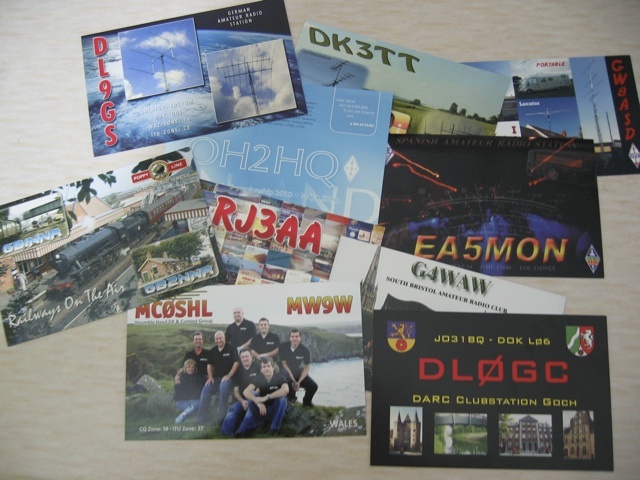 Sadly all except one were from 2010 and the remainder was from 2009 so none are from contacts made as part of QSO365 but it was really good to receive some cards in the post. This entry was posted in Amateur radio, HF, QSL, QSO365, SSB, VHF and tagged QSO365. Bookmark the permalink.